Tech-Art-Theory is a semi-studio class that integrates aesthetic, theoretical, and engineering inquiries into more multi-disciplinary platforms for research-engaged art-making. In this class, students mainly learn how to (a) build technological objects that can engage the self-discovered research topic, and (b) produce a research-related essay about the objects through their reflection studies. This class is designed and taught by a collaboration of Leo Kang (InfoSci), Steve Jackson (InfoSci) and Daren Kendall (Fine Art) in Fall 2013. 'Media Art Practice for HCI' combines aesthetic and HCI inquiries in one learning space where students can build HCI related projects through their own art practices (e.g. drawing, dance, music, photography or other self-defined practices). This course consists of sixteen in-class learning and making sessions, with approximately half (5 - 7, depending on the semester) assigned as ‘open topic session’, which covers emerging topics and practices that the instructor improvises through the weekly discussion with students. Invisible Smile is an interactive installation in which a user can produce an invisible image of smile icon on the installed screen, which only can be seen in “technology’s eyes” (thermal camera), by applying heat to the resistors through cranking an electrical generator. Good Thing is a piece of music and its music video produced by Chelsea Chan (BS 19). In this project, she composed an electronic music by mixing various sound sources from old and broken electronics with the Echo controller. 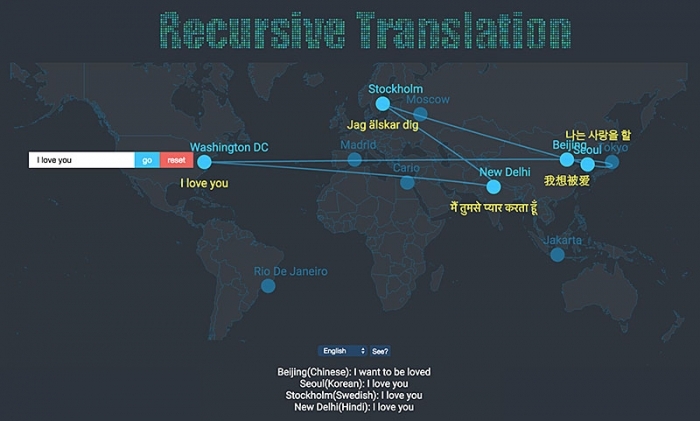 Recursive Translation’ by Yanpu Wu (MPS 2016) is "a web interface in which a user could experience the inaccuracy of computer (Google) translation in playful and speculative ways. 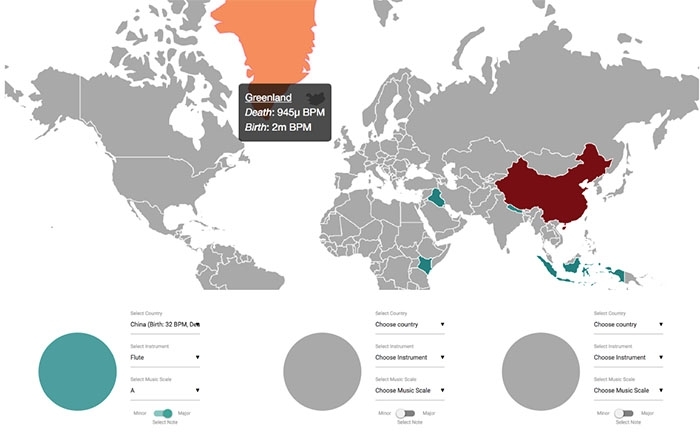 By choosing a user's own geolocation path through which the user's input sentence travels and becomes translated, this application creates an experiential space where a user's own input sentence become changed through the geolocation route, like we often experience when traveling." For the assignment 'Technology as a dance partner', Vinzons designed a dance piece in which she showed how she could consider a chair as not a tool, but an equal dance partner.